Lisa Pelc is the owner and chief executive of Bella Casa Staging & Redesign in Melbourne, a home staging and interior design company with experts in preparing homes – both occupied and vacant – for a faster, more profitable sale. 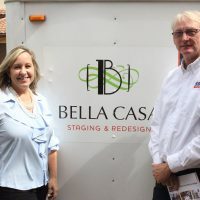 As redesigners, the professionals at Bella Casa help families reconnect to each space in their home, so that it’s organized, beautiful and a perfect reflection of the family. In 2017, Pelc found herself at a crossroads of sorts. She had started her business and it was growing, but she was asking herself some key questions: where next? How do I grow from here? That’s when she turned to the Florida SBDC at Eastern Florida State College (EFSC), a sub-center of the Florida SBDC at UCF. The list of Bella Casa’s business issues addressed with the help of the Florida SBDC at EFSC is long: reviewing and then gaining an understanding of monthly and year-to-date financial results and profitability; conducting market research and building industry knowledge; identifying new market opportunities, and learning how to balance marketing and operations. "The FSBDC has really guided me and helped me learn how, as an entrepreneur, to work on the business and not just in the business so it can grow and be more profitable every year. We’ve gone from a team of 2 to a company of 5, and our business has grown by 50 percent in just the last year. Marty and his team have been instrumental in helping me stay on task and provided a sense of accountability for myself and my company. When you tap into the resources that are at the FSBDC, the sky’s the limit for your business."